So, what does this all mean for frame design? Over the past decades, frames have been designed with shorter and shorter headtubes to please the pros seeking an advantage through a lower handlebar position. Those same geometries are then offered to the masses. As you’ve seen in part 1 and part 2, the only problem with this approach is that it’s wrong. It doesn’t work for the pros, let alone for the masses. So we need to get these headtubes longer again, and thankfully there is a way to do this without creating a problem for those riders who like their low position (out of habit or because they have the flexibility to take advantage of such a low position). The new geometry from the Cervelo R3 and S5 series has a taller headtube so that people can put their handlebars on the correct height without needing too many spacers. At the same time the bars can still be placed low enough to fit any pro rider we have ever supported. The advantage of a longer headtube is that it increases the torsional stiffness of the frame, which in turn improves handling. On aero frames, it also improves the aerodynamics because despite the headtube being wider than the bunch of spacers sitting atop of it if it were shorter, the shape of the headtube is much, much better and more than compensates for the increased frontal area. So how do riders still attain the low position with the taller headtube? If you mount a -17 degree stem (that’s a flat stem, so a stem that sits on the bike horizontally) on the new geometry, the handlebars sit just as low as they would with a -6 degree stem (the standard) on the old geometry. 3T, FSA and several other manufacturers now have such -17 degree stems available. Of course, that said no pro should ever ride the R3 except for Paris-roubaix (which it was designed for originally). The aero frames are ALWAYS the fastest solution, even in mountainous terrain, so every pro taking their profession seriously and wanting to get to the finish the fastest should ride them at all times (except Roubaix). This entry was posted on	August 8, 2011 at 15:00	and is filed under bike equipment. What about weight though, is the R3 not a lighter frame than an S3 or S5? Plus I was always under the impression there was a lower speed limit when ‘aero’ on a bike comes into play? Pros have a minimum bike weight, and the s5 hits that minimum weight too. That said, even for amateurs it would take a really nasty climb for the few grams to offset the aero advantage. What about Rider. He was on the R5ca during the Tour while others rode the S5. 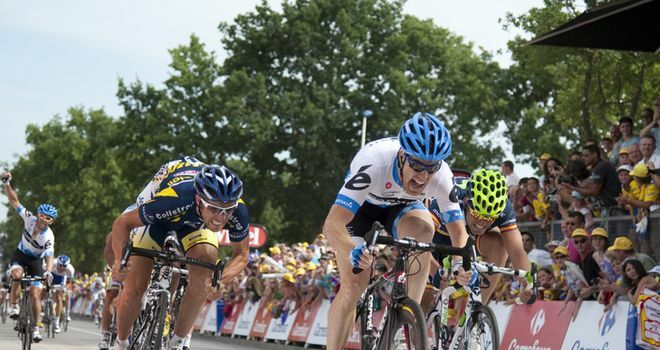 Tyler won the stage 3 TDF sprint aboard an R series frame, and indeed rode it throughout the tour. I would venture a guess that Tyler takes his profession fairly seriously. Picture confirming it is here. Curious there were apparently no aero mass-start frames in the top 20 in the Tour GC this year. Aero vs. conventional frame debate aside, I have to say that after incorporating the info in these bar height and width posts that it has been a big improvement for me, at least so far. I happened to stumble on this blog just recently and decided to give these changes a try. It is rare that people in the industry challenge the conventional wisdom, but I thought the arguments made a lot of sense. So I went and bought some narrower bars and raised my bars from their previously slammed position, and not only has my comfort been increased by miles, but I am able to ride faster for a longer period of time while eliminating comfort issues I previously had. I don’t have a power meter but I would assume that I am putting out a good bit more power now. I would say everyone should at least give these changes a try. It is worth doing as it could end up unlocking a lot of performance, and very cheaply. Anyway, thanks for the insight Gerard! Overall I’ve been happy with it comfort wise, it feels fine on long rides so thanks for all the design work! This is very interesting Gerard and very good explained as well. I’m sure as you say that a higher head tube is better, both for stiffness and turning. Keep the good interesting blogs coming. Tomorrow Tour of Utah starts, will ride against your guys then. I test rode the R3 and RS back to back and preferred RS for it’s greater comfort, not least of which was being able to run bars at comfortable height without the need of extra (non-pro looking and non-aero) spaces to do so. It seems that many companies are reluctant to increase the length of the head tube as it makes for a very odd looking bike when the top tube has a large degree of downward slope to the seat tube. Cervello gets away with it as they only have a slight downward slope. Imagine a Giant with another 20-30mm of length in the head tube. It would look silly. Given that frames are stiffer than they have ever been, and can be made considerably lighter than the UCI weight limit, I wonder why we still have the ‘compact’ design. Why not have a level top tube again? I’m sorry, but I think the main problem is that when integrated headsets became de rigeour, manufacturers kept the head tube lengths the same refraining from adding the additional stack height provided and allowed by the external set. That’s certainly part of it, as I mentioned somewhere else. However, that’s only a small part of the overall bar height drop that we’ve seen over the past 30 years. Changes in hood shape making the hoods more comfortable and therefore a more viable position also play a role. There are many factors, but the bottom line is that the bike should be set up to put the rider in the best position, it’s not the rider who should adapt him/herself to the bike. I agree with that one-hundred percent. But, I think it’s a rather large generalization to say that we all need larger headtubes. I for one agree longer headtubes would do the average to average competitive rider a great justice, but no one single person is built the same. I’ve fitted hundreds of cyclists to frames, many on Cervelos, and the best thing I can compare bike fitting to is a golf swing. Everyone’s innate anatomy is different with some similarities and tendencies…but just because we are the same height, and have the same saddle height and arm length…does not mean that we fit the same bike. Yes, we should raise headtubes…but I think by arguing that a 17* stem is more aero than a 6* stem when that makes less of a difference than if I have long hair or not in terms of aerodynamics…is a bit of a stretch. I recently have lowered my stem position by 20mm, and I feel the bike handles better. It feel that when I am at high efforts, I am more comfortable and powerful…I also have lost a lot of the nagging IT band pain that I had in the higher position. Higher isn’t necessarily better for everyone. As always, I appreciate your commentary. It’s a level of transparency much needed between the people making the products we remortgage our homes on. Thanks Gerard! Hi Adam, thanks for the feedback. Not sure where you get the -17 being more aero than -6 part, that’s not something I said is it? At least it’s not something I meant. The point is that if people liked the “old” Cervelo geometry with their standard -6 degree stem, they can get the same position on any “new” Cervelo just by going to a -17 degree stem. What do you think about bar height and reach in relation to weight distribution? A lot of pros ride really long and low, which puts a lot of weight over the front end, but I’ve noticed that a lot of US domestic pros that race a lot of technical and tight races run their bars a bit inwards and slightly higher so that they can spend more time in the drops and even out their weight distribution. So, the hands end up more under the shoulders, but aren’t any lower because the bar is actually higher so they actually have more bend in their elbows. Any feedback on this notion? First of all, I appreciate your blog, and I appreciate your work… Moreover, I’m seriously considering a S5 for my next bike. I totally agree with what you wrote : to achieve an aero position you don’t need a very low bar, you need above all to ride in the drops, with your arms bend and your shoulders low and rounded. But bar height is related to the setback of the saddle, the lenght of the top tube, and, finally, given the morphology of the rider, the mass distribution between the front and the rear wheel. I’m wondering about a few things that I hope you will help me to clarify (sorry if it is a little complex and unclear, english isn’t my mother’s tongue). Now, given all that, I could easily implement the “high forward bar” position on a 56cm S5, with a -6° 130 or 140mm stem. If I want to implement the “low bar” position, which I think is better for me given my morphology (but I could be wrong), I could either choose a 56cm frame with a -17° 100 or 110mm stem, or a 54cm frame with a -6° 120 or 130mm stem and a little spacer. I wonder which size will handle better, given the 12mm shorter front-center of the 54cm frame ? Sorry for writing so much ! Given those two options I would definitely suggest the 56cm for you, the 54cm will be very small. And especially as you intend to rotate forward, it is good to go with the longer front-center. I’ve always thought that a taller headtube is more flexy than a shorter (my common sense says). Why you don make the frame more compact (with shorter headtube) and offer a +0, +5 stem? maybe this is more aero and stiff, isn’t it? Interesting points but my experience suggests just the opposite. Granted I no longer have much to do with racing but more than a few of our Italian bike tour clients are racers or ex-racers along with folks who’ve never pinned on a number. I find the trend going the other way, bikes now come in just t-shirt sizes and seem to be optimized to feel comfortable for the minute or so the customer is sitting on it in the showroom. The extended length headtubes and sloping top tubes on many North American designed bicycles make the frame no longer a diamond but a slanted rectangle. Clients renting bikes from us send us three key dimensions as to fit and I’m quite often amazed at the upright position they’re in – the weight distribution is awful and you can tell on the descents…the more upright they are the more tentative they seem to be. Even worse, as Gerard pointed out, too many put their hands only on the hoods where control is less than optimum in my opinion. When I see the pros using 15 cm stems with large negative rise it tells me the bike is simply the wrong size or dimension as those seem to be chosen to appeal to the consumer in the bike shop rather than the pro who races on them. With carbon-fiber molds being expensive it seems the pro racer is doing with less-than-optimum equipment at times solely to facilitate the sales goals of the bike sponsor. This theme was pointed out in a recent issue of the Italian Bicisport magazine as well. I have both an S5 Team and an R5VWD and beyond just Roubaix, I think that on true “mountain” days that involve a lot of climbing and demanding descending, I prefer the R5. Maybe I’m a few seconds slower on the climb on the R5 (though it sure doesn’t seem that way), but I think I make up for it on the descents – the R5, IMHO, is better handling than the S5. I don’t mean to suggest that the S5 is poor handling – if it was, I would not keep it in my stable – the S5 handles just fine, thank you very much. The R5 is just something truly special in that department. Well, the R5ca is a whole different animal altogether, it doesn’t compare with any other bike in my opinion. That different animal is referring to the ride, not the geometry. Sizes carry across seamlessly, so if you’re a 58cm S3 you would also be a 58cm R5ca. Do you use any spacers on your S3 (and what angle of stem)? It is interesting to see this topic raised and further discussed as a “new” thing. In a late-90s issue of a cycling magazine (Cycle Sport?) Chris Boardman wrote about his road bike position. Specifically he addressed his early assumption — as a time triallist — that his road position should be as low as possible. When racing in the UK this is how he rode. After moving to a French team on the European circuit he received advice (I’ve forgotten who he mentioned) to raise his handlebars and later believed this to be correct and overall very effective. The article included photos of his early position on a Cougar and later a Gan team bike with handlebars noticeably higher. Boardman was known as a rider who did his homework, looked for effective ideas and did not follow trends. Many of his ideas from the 90s are being applied now by Sky and British Cycling with great success. His is yet more advice that should cause riders to reconsider the idea of slamming a stem to keep handlebars as low as is possible. Hi David, thanks for your comments. I certainly don’t consider it a “new” thing, in the Merckx era and before (and even a bit after) the bars were also much higher than they are now. Yes, that is true about the older eras — I didn’t mean that the idea of having higher handlebars is “new”. I meant the trend of handlebars becoming too low was already noticed and being discussed at least 15 years ago — but the trend continues nonetheless. That’s the thing with discussing problems in cycling 15 years ago. Nobody was listening! Sorry, just couldn’t resist. Having said that Boardman specc’d very low head tube on his origional TT bike suggesting this was the way forward for TT’ing. Yes — this was for TTs, with the saddle up and forward compared to road positions to have the rider position rotated at the BB and flattening the back with low shoulders. The UCI introduced saddle position restrictions for a reason. There is also a reason why this was/is an issue on TT bikes but few road riders want to jam their saddles forward for day-to-day riding and racing. The Question is would an S5 with a normal sized headtube and no spacers be more aero than an S5 with the current long headtube and a – 17 degree stem? I wonder if the racers at the more pointy end of events where those saved seconds maybe of greater importance are loosing out a little to gain a better fit to cyclists who would save more time by improving their position and flexability than by switch to an aero frame? “a normal sized headtube”: Comparing an S5 against older framesets with threaded headsets and including the pressed cups and nuts in the sum of the height shows that an S5 (and R5) has a historically, fairly normal headtube measurement. In the day of threaded headsets -17° stems were the absolute norm, not the exception. “those saved seconds”: In road racing the assumption that lower = more aero = faster is often based on zero facts. Add to this Vroomen’s long-standing point that one should target a drops-oriented performance position, not the hoods position many current riders focus on, and the assumption becomes weaker. The following is vague and very thin but I don’t have the time to look up references: a rider on Team Cervelo/Garmin (whatever it was at the time) spoke in an interview (cyclingnews.com?) of the sharing/learning environment on the team and how Dave Zabriskie opened his and other teammates’ eyes to the fact that one could be more aero on a road bike with a higher position — this advice apparently being based on repeatable facts.